James Francis Aloysius McIntyre (June 25, 1886 – July 16, 1979) was an American prelate of the Roman Catholic Church. 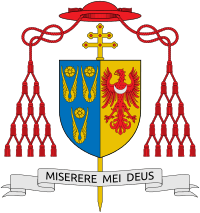 He served as Archbishop of Los Angeles from 1948 to 1970, and was created a cardinal in 1953. James McIntyre was born in Manhattan to James and Mary (née Pelly) McIntyre. His father was a native of New York City and member of the mounted police, and his mother was from Kiltormer, County Galway, Ireland. McIntyre attended Public School No. 70 because there was no room for him at the local parochial school. His father was rendered an invalid after falling from his horse in Central Park and sustaining serious injuries; his mother then opened a dressmaking business to support the family. Following his mother's death in 1896, McIntyre and his father were taken into the nearby home of a relative. He did not attend high school, instead becoming an errand boy in the financial market at the curb of Broad Street and Exchange Place. He attended night school at Columbia University and City College. At age 16, McIntyre became a runner on the New York Stock Exchange, working for the brokerage firm of H.L. Horton & Co. He was offered a junior partnership at Horton in 1914, but declined in order to pursue Holy Orders. He then studied at Cathedral College for a year before entering St. Joseph's Seminary in Yonkers. McIntyre was ordained to the priesthood by Archbishop Patrick Hayes on May 21, 1921. He then served as assistant pastor of St. Gabriel's Church in the Lower East Side until 1923, whence he became assistant chancellor for the Archdiocese of New York. He was promoted to chancellor in 1934, and named Privy Chamberlain of His Holiness, Pius XI on December 27 of that year. Appointed a Domestic Prelate by Pope Pius XI on November 12, 1936. Following the ascension of Francis Spellman to Archbishop of New York in 1939, McIntyre was also named to the archdiocesan board of consultors. In 1939 he formed the Knights of Columbus women's auxiliary the Columbiettes. On November 16, 1940, McIntyre was appointed Auxiliary Bishop of New York and Titular Bishop of Cyrene by Pope Pius XII. He received his episcopal consecration on January 8, 1941 from Archbishop Spellman, with Bishops Stephen Donahue and John O'Hara serving as co-consecrators, in St. Patrick's Cathedral. He became vicar general of the Archdiocese on January 27, 1945, and received the Grand Cross of the Order of the Holy Sepulchre in May 1946. He once claimed that accounts of anti-Semitism in New York were "a manufactured movement...for the deliberate purpose of besmirching the minority Catholic population." 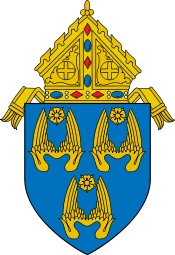 On July 20, 1946, McIntyre was named Coadjutor Archbishop of New York and Titular Archbishop of Paltus. Despite never succeeding Spellman as Archbishop, he greatly assisted in the governance of the Archdiocese while Spellman was busied by his additional duties as Apostolic Vicar for the Military Forces. Spellman once said, "I have never undertaken any important matter without consulting [McIntyre]. In nothing have I gone contrary to his advice." In 1947, he spoke out against legislation that would "permit further encroachments on the parental function of education." McIntyre was appointed the second Archbishop of Los Angeles, California, on February 7, 1948. Replacing the late John J. Cantwell, he was installed at St. Vibiana's Cathedral on the following March 19. In McIntyre's first four years alone, 26 new parishes, 64 parochial schools, and 18 high schools were established. At one point during his tenure, he oversaw the construction of a new church every 66 days and a new school every 26 days to accommodate the post-World War II population boom. One of his greatest accomplishments as Archbishop was leading the successful effort to repeal the state tax on Catholic schools. Pius XII created him Cardinal Priest of Santa Anastasia in the consistory of January 12, 1953. McIntyre was the first cardinal of the Western United States. At the consistory, when the official photographer's flash bulb failed to go off when the biretta was conferred, Pius and McIntyre re-enacted the ceremony, albeit with wide smiles. McIntyre was also one of the cardinal electors who participated in the 1958 papal conclave, and again in the 1963 papal conclave. Cardinal McIntyre gracefully resisted elements in the church who disagreed with Church Dogma. He suspended Father William DuBay, who had called for McIntyre's removal in 1964 for not sufficiently supporting civil rights movement, after the latter advocated a labor union for Catholic priests and published a book sharply critical of the Catholic Church hierarchy. When Bishop James P. Shannon expressed views critical of the Church hierarchy in an NBC documentary in the late 1960s, McIntyre described Shannon's views as constituting "incipient schism." He also had a noted dispute with the Sisters of the Immaculate Heart of Mary, whom he barred from teaching within the Archdiocese in 1967 after they started promoting liberalism, abandoning their traditional discipline—such as eliminating the habit and compulsory daily prayer. The feud even went to the Vatican, which demanded that the group either restore its former practices or request dispensation from their vows; 315 of the 380 members sought dispensation and formed their own independent organization. 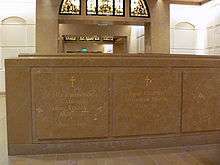 The former tomb of James McIntyre in the crypt of the Cathedral of Our Lady of the Angels, Los Angeles, it has since been moved. The end of McIntyre's tenure was filled with rancor, as he found himself at odds with blacks, Hispanics, and his own clergy. He was once confronted during Mass by the activist Católicos por La Raza, whom he compared to "the rabble at Christ's crucifixion." It is reported that he harbored racial prejudices and was approached privately by the priests of his archdiocese who asked him to refrain from making racial slurs. He retired after twenty-one years as Archbishop on January 21, 1970, and then served as a parish priest at St. Basil's Church in Downtown Los Angeles, where he privately celebrated the Tridentine Mass on the side altars of St. Basil's. McIntyre died at St. Vincent Medical Center in Los Angeles, at the age of 93. In 2003, his remains were transferred to the crypt of the new Cathedral of Our Lady of the Angels. 1 2 3 4 Miranda, Salvador. "MCINTYRE, James Francis". The Cardinals of the Holy Roman Church. 1 2 3 4 5 6 7 8 9 10 11 12 13 Thornton, Francis. "James Cardinal McIntyre". Our American Princes. ↑ "Bishop v. Archbishop?". TIME Magazine. 1944-03-20. ↑ "On Borrowed Time". TIME Magazine. 1970-02-02. ↑ McGirr, Lisa (2001). Suburban Warriors: The Origins of the New American Right. Princeton University Press. ↑ Isserman, Maurice; Kazin, Michael (2008). America Divided: The Civil War of the 1960s (3 ed.). New York: Oxford University Press. ↑ "A New Way of Worship". TIME Magazine. 1964-11-27. ↑ "For a White-Collar Union". TIME Magazine. 1966-03-04. ↑ "The Issue of Imprimatur". TIME Magazine. 1966-08-19. 1 2 "The Immaculate Heart Rebels". TIME Magazine. 1970-02-16. ↑ "Timothy Cardinal Manning, 79; Guided Los Angeles Archdiocese". The New York Times. 1989-06-24. This article is issued from Wikipedia - version of the 9/10/2016. The text is available under the Creative Commons Attribution/Share Alike but additional terms may apply for the media files.